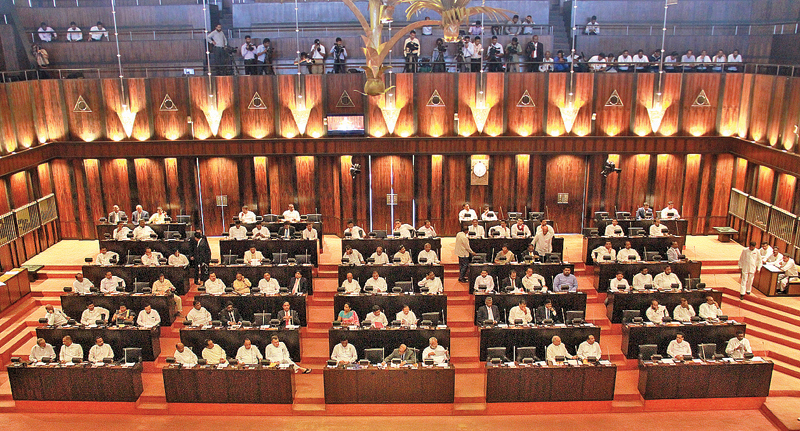 Whatever the policy differences they have, the two high ups in the ruling hierarchy, President Maithripala Sirisena and Prime Minister Ranil Wickremesinghe were unanimous in their public pronouncements that there is no possibility to submit a draft constitution to the current Parliament of which the term will expire in August 2020. President Sirisena, allaying the fears that the unitary status and the place given to Buddhism in the constitution were in danger, clarified that no proposal has been submitted so far to the Cabinet or the Parliament on a new constitutional draft. Premier Wickremesinghe went further and said earlier this week that there is absolutely no chance to present a proposal for a new constitution to the current Parliament as neither the ruling party nor the opposition has the required majority to get such a bill passed by a two-thirds majority. At the same time, both assured that the new Constitution would not change the unitary nature of the country. After the UPFA withdrawal from Yahapalana government and installation of Mahinda Rajapaksa as Prime Minister in October 2018, the United National Party (UNP) obtained the support of the Tamil National Alliance (TNA) to make a comeback with a show of majority in Parliament. Since then Mr. Wickremesinghe was accused with the allegation that his government is drafting a new Constitution to appease the main Tamil political party. What was submitted to Parliament was a report submitted to the Steering Committee in August 2018 by two experts of the Panel, Prof. Camena Guneratne, Professor of Legal Studies, Open University, and Prof. Kapila Perera, Vice Chancellor of the University of Moratuwa. The discussion paper was submitted with the aim of producing a document that could be a working paper for the Steering Committee. The majority opinion is that there is no reason to have different words to define the term unitary, which is ‘aekeeya’ in Sinhala. However, the Tamil word ‘orumithtaandu’ has a different meaning. TNA MP Abraham Sumanthiran, who assisted the drafting of the steering committee paper, acknowledged that there was a difference in meaning. However, he tried to defend the inclusion of the new Tamil word by adding the word ‘indivisible’ to ensure that Sri Lanka is a ‘united’ country. Most constitutional analysts are of the opinion that the proposed change is aimed at establishing a federal state without using the word federal which is unacceptable to the majority. Now it is interesting to see how the announcement of Mr. Wickremesinghe affect the understanding between the UNP and TNA. Already a section of the TNA is opposed to the decision taken by Sampanthan-Sumanthiran duo to support the UNP government from outside. Now that TNA dissidents could even demand a shift in the position viz-a-viz UNP government. There was a considerable delay in submission of the Steering Committee’s report on the new constitution. The First Interim Report of the Steering Committee was presented to the Constitutional Assembly by Prime Minister Ranil Wickremesinghe in the capacity of Chairman of the Steering Committee in November 2016. The Report is a compilation of the six sub-committee reports on Fundamental Rights, the Judiciary, Law and Order, Public Service, Public Finance and Centre-Periphery Relations. MP Dinesh Gunawardena said their group had submitted a 14-point plan and they had not been considered by the Steering Committee. He asserted that they would not agree on diluting the unitary nature of the state or diluting the position given to the majority religion of Buddhism. Nimal Siripala de Silva, a member of the Steering Committee stated in early stages of discussions that there was no necessity to a new constitution and that amendments to the existing Constitution were sufficient. Prior to Premier Wickremesinghe’s admission that a new constitution could not be tabled now, the Leader of the House Lakshman Kiriella said in Parliament that the government’s objective is to bring forth the new Constitution, followed by a referendum with the support of the SLFP. He said this while replying to a question raised by MP Wimal Weerawansa. Kiriella said the government is optimistic about the new Constitution. “The government is very clear on two main points. One, we will bring forth a new constitution. Then we will go for a referendum,” he said. The six sub-committees were mandated to develop constitutional principles for consideration of the Steering Committee in respect of the designated subject areas. Each Sub-Committee consists of 11 members, including the Chairman. In whatever the form it comes, majority of Sri Lankans strongly feel that the Constitution should ensure that Sri Lanka shall be one, independent, free, sovereign Republic and the State shall safeguard independence, sovereignty, unity and territorial integrity of the Republic and shall promote and preserve peace and harmony among various people of the country while promoting a Sri Lankan identity. This is not the first time the constitution drafting process was deadlocked. We saw the Bandaranaike-Chelvanayakham Agreement of 1957 and Senanayake-Chelvanayakham Agreement of 1966 ran into trouble, by opposition from the UNP and the SLFP respectively. J R Jayewardene, Ranasinghe Premadasa and later Mahinda Rajapaksa made attempts to find consensus through All Party Conferences that were abandoned midway. The best opportunity for success was the draft constitutional bill presented during the tenure of Chandrika Bandaranaike Kumaratunga, where ended in ashes when the UNP opposition set fire to the bill inside the August House. The current Parliament failed to present a constitutional bill in the early stages of the unity government. The process was streamlined at a lethargic slow pace and before it saw the light of the day, the yahapalana government collapsed. This is another proof that Sri Lanka needs statesmen and not mere leaders who play to the gallery and not capable of taking risks in the larger interest of the future of the nation. The constitutional hoodoo continues.